Spanish based computer manufacturer Slimbook revealed the new all-in-one Linux Slimbook Curve. The GDE/Linux based Slimbook curve comes with a 24-inch curved screen for a premium look. Makers had made this Linux all-in-one PC available in Intel Core i5 or Core i7 CPU variants. The desktops can be coupled with 8GB or 16GB DDR4 RAM. However, the company is planning to offer a 32GB memory option for its buyers soon. The Linux Slimbook Curve 24 is first of its kind all-in-one PC which has similar specs with the recently launched KDE Slimbook II. Yet, the newly launched PC provides few more hardware improvements over the earlier KDE Slimbook. Buyers can choose between 120GB and 1TB of SSD storage to configure their Linux all-in-one Slimbook. Western Digital, Kingston and Samsung the tech giants offering the SSD’s for the M.2 slot. On the other hand, a 2.5-inch second slot is facilitated for installing mechanical HDD or SSD. 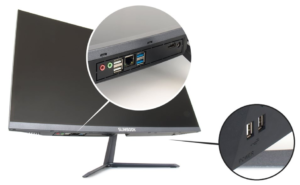 Discussing the slimbook curve design, the Linux all-in-one PC features a near borderless design with a metal bar at the base of the screen. The display offers an FHD screen resolution of 1,920 x 1080 pixels. The connectivity ports include two USB 3.0 ports, four USB 2.0 ports, an HDMI output, and headphone jack. Also, the desktop supports Bluetooth 4. Users can either pick Intel dual-band 3160AC Wi-Fi chip or Intel dual-band 82565AC chip for Wi-fi connectivity. The entry-level variant Linux slimbook curve with Core i5 processor, 8GB of RAM, and 120GB SSD is priced at $1040. Besides that, the Core i7 trim 8GB RAM costs $1,165 and the price goes over $1,840 for higher configurations. The manufacturer states that it takes around three months for them to assemble the device and ship. Users can avail Ubuntu, KDE Neon, Kubuntu, Debian, Open Suse, Linux Mint, Fedora, Antergos, or Elementary OS without any charge. Also, the makers are also shipping the PC with no operating system as per buyer request. In addition, Windows 10 Home and Pro are also being offered on request. Yet, buyers need to pay the extra charge to get the Windows versions. Amazon is paving its way to make its Alexa more human with its latest update. Users are tired of Alexa musical sound with a verbal confirmation each time when asked to do something. Now, the latest Alexa update cuts down the chatty experience and the “OK”. This latest Alexa Brief mode will take follow-up questions without any wake word on subsequent questions. Users can activate Alexa Brief Mode in the Alexa app on their smartphones. This Brief mode in Alexa will respond to few commands with a short chime noise over the earlier “OK”. Also, the smart assistant will now speak less frequently in general. Users can deactivate Alexa Brief Mode just by turning off the toggle switch for brief mode. The same settings are applicable to switch Alexa Brief Mode on/off in the Alexa Web portal. However, users who feel ok with the verbal confirmation each time can continue without the Brief mode. Recently, the E-commerce giant has also updated the Follow-up mode in the smart speaker. This Alexa follow-up answers questions without saying the trigger word each time. But, the feature isn’t made available on every Alexa-compatible devices. However, the newly introduced Brief Mode is provided in all compatible devices. Essentially, this new feature cuts down the “OK” everywhere and replaces it with classy beep sound. Yet, interested user’s can still continue to hear Alexa voice every time you pass a voice command to Echo. Never the less, this less talkative feature is much needed one for many of the users. Amazon India is now with an interesting quiz contest for a free giveaway of Amazon Echo speaker. The E-commerce giant has recently launched its new Amazon Echo speaker, an AI-based assistant. 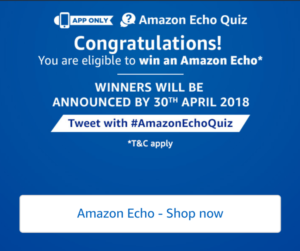 Now, this Amazon Echo quiz is an app only contest to promote Amazon Echo in India. Since the AI-base voice assistant made its debut in India recently, Amazon is making its move to lure customers. Essentially, Amazon Echo is a hands-free smart speaker which works on your voice commands. It runs Alexa – a cloud-based voice assistant which has set to run smart functions. Usually, the list includes making calls, checking weather and news, playing music, set alarms, control smart home devices etc. Amazon Echo Quiz is exclusively for the Amazon app users. Here are the steps to play Amazon quiz contest. Click on that Amazon Echo quiz contest banner. Click on the “Start’ button to play the Quiz. The Contest begins on 19th March 2017 from 12:00:01 a.m. ends on 15th April 11:59:00 p.m. User must sign-in to or sign-up from an account on the Amazon App during the Contest Period. Users need to provide answers to the 6 questions during the entire Contest Period. He/she will be entitled to a lucky draw if they answer Amazon quiz questions correctly. A total of 20 participants will be selected randomly and will be declared as winners. Besides downloading Amazon India app, Users need to fulfil eligibility criteria to enter the Amazon Echo Quiz Contest. Participants should be an individual legal Indian resident of the Republic of India. He/she should set India as the current country in Amazon app account settings. User billing address must be within Indian Territory. Participant should be at least 18 years or above of age while contesting. Yet, the E-commerce giant also kept some restrictions to make this contest in a transparent way. Amazon employees and their immediate family members, other Amazon associates are not eligible to enter the Contest.